All photos may be enlarged. Just click on the photo. 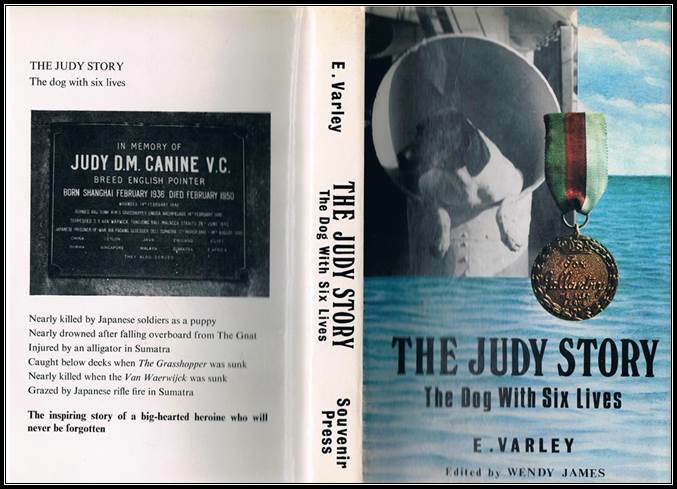 Judy was born in Shanghai Dog Kennels in 1937. 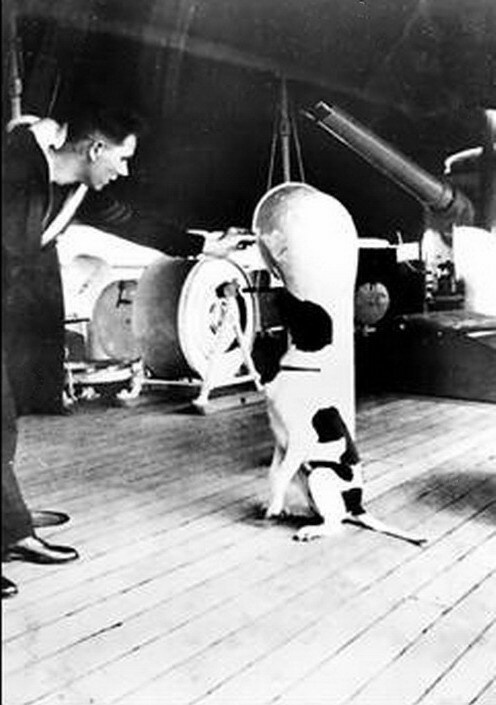 A pure-bred liver and white Pointer, she was presented to the Royal Navy as a mascot at a young age. She was originally assigned to HMS Gnat, an Insect class gunboat, as the ship's mascot. She had a series of misadventures including, at one point, falling overboard into the Yangtze River. Judy was known for pointing out the approach of hostile Japanese aircraft long before any of the human crew could hear them. She was transferred to HMS Grasshopper, a Dragonfly Class River Gunboat. In February 1942, while accompanied by HMS Dragonfly, the ship was attacked by fighter-bombers and was forced to beach on a nearby island. HMS Dragonfly fared worse and sank quickly after two direct hits. The island, known as Sinkep island, turned out to be uninhabited with little food and no apparent water. Judy appeared two days later covered in oil, and began to dig at the shoreline. It took a couple of minutes, but Judy managed to unearth a fresh-water spring and is credited with saving everyone's lives. The crew, along with Judy, commandeered a Chinese junk and managed to sail to Sumatra. They then embarked on a 200-mile cross-country trek across the island in an attempt to reach Padang. Several miles from their destination, they walked into a Japanese-held village and were captured. The crew became prisoners of war and smuggled Judy along with them, hidden under empty rice sacks, for five days during the journey to the Gloergoer prisoner of war camp in Medan. Chief Petty Officer Leonard Williams recorded, "thus began 3-4 years of the most horrific labour, torture, starvation and every degradation the Japanese could inflict on us". 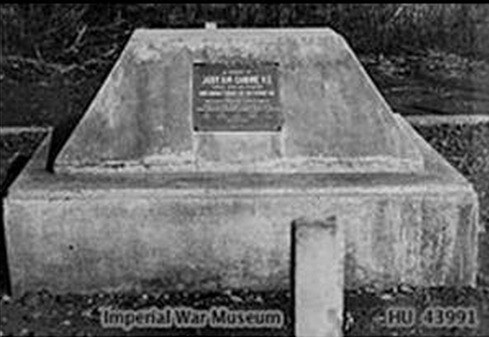 Once Judy arrived in the Medan camp, she met Leading Aircraftman Frank Williams (1919–2006), who adopted her and shared his daily handful of rice from August 1942 onwards. In the camp Judy would intervene by distracting the guards when they were administering punishment. She was the only animal to have been officially registered as a prisoner of war during the Second World War, after Frank William's intervention to protect the dog from the guards, who would often threaten to shoot Judy as the dog growled and barked at them. 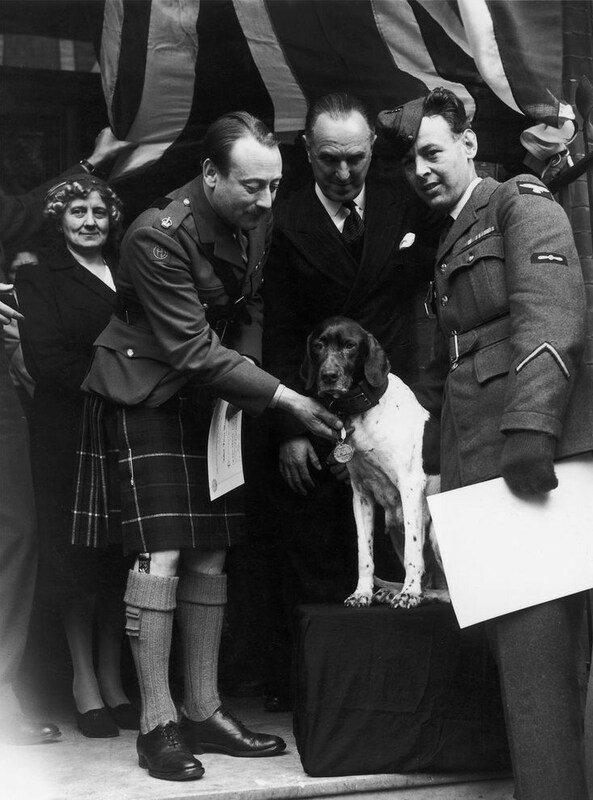 Williams managed to convince the camp Commandant, who was drunk on sake, to sign the registration papers with the promise of one of Judy's future puppies. Judy's official prisoner-of-war name was '81A Gloergoer, Medan'. During her stay at the camp, she would alert the prisoners to the approach of the Japanese guards and also if other animals such as snakes or scorpions were around. 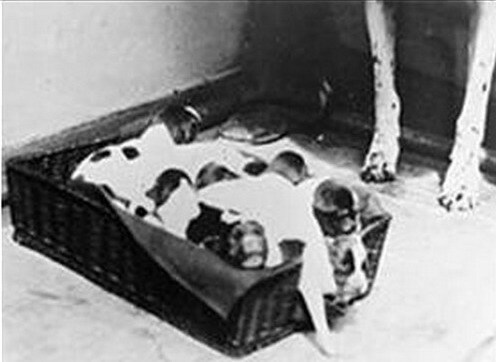 When Judy had puppies, one was given to the camp Commandant as promised. 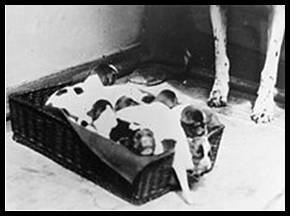 Another puppy was smuggled into the women's camp along with any food that the men could spare. In June 1944, the men were transferred to Singapore aboard the SS Van Waerwyck. 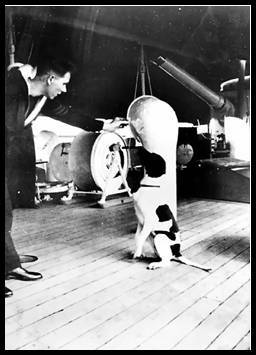 Dogs were not allowed on board, but Frank Williams managed to teach Judy to lie still and silent inside a rice sack. When he boarded the ship, Judy climbed into a sack and Williams slung it over his shoulder to take on-board. For three hours the men were forced to stand on deck in the searing heat, and for the entire time Judy remained still and silent in the bag on William’s back. The conditions on board the ship were cramped with more than 700 prisoners. On 26 June 1944, the ship was torpedoed. Williams pushed Judy out of a porthole in an attempt to save her life, even though there was a 15 feet (4.6 m) drop to the sea. He made his own escape from the ship, not knowing if Judy had survived. One of Judy's litters of puppies. Frank Williams was recaptured and was sent to a new camp without news of Judy's survival. However, stories began being told of a dog helping drowning men reach pieces of debris on which to hold, and others recalled how the dog would bring them flotsam to keep them afloat. The dog would also allow men to hold onto her back while swimming them to safety. Williams was giving up hope of finding Judy when she arrived in his new camp. "I couldn’t believe my eyes. As I entered the camp, a scraggy dog hit me square between the shoulders and knocked me over! I’d never been so glad to see the old girl. And I think she felt the same!" They spent a year in Sumatra, with the Japanese using the men to cut through the jungle to lay railway track. Rations were a handful of maggot-ridden tapioca a day, which Frank continued to share with Judy. Frank credits Judy with saving his life during his time spent there, "She saved my life in so many ways. The greatest way of all was giving me a reason to live. All I had to do was look at her and into those weary, bloodshot eyes and I would ask myself: What would happen to her if I died? I had to keep going. Even if it meant waiting for a miracle." The guards had grown tired of the dog and sentenced her to death. She managed to hide out in the jungle where she supplemented her diet with snakes, rats and monkeys. One incident with an alligator left her injured. Once hostilities ceased, Judy was smuggled aboard a troopship heading to Liverpool. With the help of the troops with which she had been imprisoned, Judy managed to avoid the dock police and was delivered into the care of the ship's cook, who ensured that she was fed on the voyage home. Upon her return to the UK, Judy stayed for six months in quarantine in Hackbridge, Surrey. and also for saving many lives through her intelligence and watchfulness". 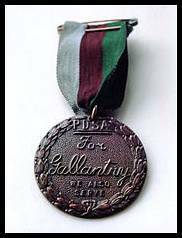 At the same time, Frank Williams was awarded the PDSA's White Cross of St. Giles, the highest award possible, for his devotion to Judy. Judy's grave in Tanzania, Africa. She was interviewed by the BBC for their coverage of the London Victory Celebrations of 1946 on 8 June and her barks were broadcast to the nation on the radio. Frank and Judy spent the year after the war visiting the relatives of PoWs who hadn't survived; Frank remarked that Judy always seemed to give a comforting presence. On 10 May 1948, the pair left to work on a government-funded food scheme in East Africa. After two years there, Judy was discovered to have a tumour, and was put to sleep at the age of 13. Frank spent two months building a granite and marble memorial in her memory, which included a plaque which told of her life story. On 27 February 1972, Judy was remembered in church services across Gosport and Portsmouth, and in 1992 her story was featured in the British children's TV show Blue Peter. 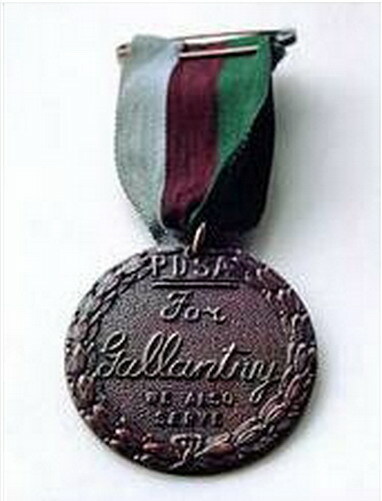 In 2006 her collar and medal went on public display for the first time in the Imperial War Museum, London, as part of "The Animals' War" exhibition. It was presented to the IWM by Alan Williams, Frank's son. 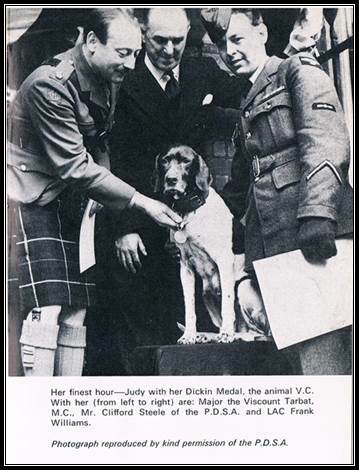 Judy became an airbase mascot after the war.